In Sansekertasri language means "luminous" and the victory means "victory". Preliminary evidence regarding the existence of this kingdom from the 7th century; a Chinese pastor I-Tsing writes that he visited Srivijaya in 671 and stayed for 6 months. The oldest inscriptions of Srivijaya also be in the 7th century which inscription Kedukan hill in Palembang bertarikh 682. Sriwijaya (Srivijaya) adl a powerful maritime kingdom on the island of Sumatra and influential in the archipelago's territory covers Cambodia Thailand Srivijaya Malay Peninsula Java, Kalimantan, Sumatra and Sulawesi. The decline of Srivijaya influence on regional subordinates began to shrink because some of the attacks peperangandiantara Dharmawangsa king of Java Ditahun 990 and 1025 years of Coromandel Coladewa Rajendra attack next year under the control of the kingdom of Srivijaya 1183 Dharmasraya. And at the end of the submission under this kingdom of Majapahit kingdom. Sumatran Srivijaya became a symbol of greatness and the beginning of the archipelago except the kingdom of Majapahit in East Java. In the 20th century both kingdoms became olehkaum nationalist references to show that Indonesia is a unitary state sebelelum Dutch colonialism. Sriwijaya called with various names. The Chinese call Shih-li-fo-shih, or San-fo-Fo ts'i or San Qi. In Sanskrit and Pali Srivijaya kingdom called Yavadesh and Javadeh. The Arabs call Zabaj and Khmer call Malayu.Sementara of Ptolemy map is found a description of the island there are three who Sabadeibei associated with Sriwijaya. Srivijaya's existence is known formally in 1918 by French historian George Cœdès from the École Française d'Extreme-Orient. Around 1992 to 1993 Pierre-Yves Manguin proved that the center of Srivijaya in the Musi River between Bukit Seguntang and Sabokingking (located in South Sumatra province of Indonesia). However Soekmono argues that the center of Srivijaya is located in Jambi province in the region is now the Batang Hari sehiliran between Muara Muara Sabak to Tembesi. 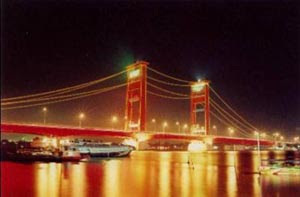 Sriwijaya kingdom as a trade center and a maritime nation. These countries did not extend beyond the power of the islands of Southeast Asia with the exception of contributing to the population of Madagascar in the west as far as 3300 miles. Around the year 500 the root of Sriwijaya began to flourish in the region around Palembang Sumatra. This kingdom consists of three main zones of the estuary area of the capital of Palembang who centered the Musi River valley who serves as regional supporters and rival estuarine areas who are able to be a rival power center. Musi river upstream region is rich in various precious commodity for traders who governed the capital city of China directly by the authority while still supporting the area was ruled by the local datu. The expansion of this empire to Java and the Malay peninsula made the Srivijaya controlled two major trade center in Southeast Asia. Based on the observations are found ruins of temples in Thailand and Cambodia Srivijaya. In the 7th century Cham seaport in eastern Indochina started to divert a lot of traders from Sriwijaya. To prevent this the Maharaja Dharmasetu launched several attacks on the coastal cities in Indochina. Indrapura town on the banks of the Mekong river at the beginning of the 8th century under the control of Srivijaya. Srivijaya continued dominance over Cambodia until the Khmer king of Khmer empire founder Jayawarman II broke with the kingdom in the same century. DariPrasasti Kedukan Hill in the year 682 under the leadership of the Kingdom Minanga Dapunta Hyang Jayanasa submission under the Srivijaya empire. Possession of the gold-rich Malays who have increased the prestige of the kingdom. Limestone City BerdasarkanPrasasti yg yg dates to 682 and found on the island of Bangka At the end of the 7th century this empire had taken control of the southern part of Sumatra island to Lampung Bangka and Belitung. This inscription also mentions that Jayanasa has launched a military expedition to punish Bhumi Java Sriwijaya unrequited devotion to this event along with Tarumanagara collapsed in West Java and holing (Kalinga) in Central Java, who is most likely due to attack Srivijaya. Srivijaya grew and managed to control the maritime trade routes in the Straits of Sunda Strait the South China Sea Java Sea and the Strait of Karimata. The 7th century Chinese records that there were two kingdoms on Sumatra and the Malay in Kedah and the three kingdoms of Java into the Srivijaya empire. At the end of the 8th century several kingdoms in Java, among others Tarumanegara and holing under the authority of Sriwijaya. According to the records of this period also Malay-Buddhist dynasty Sailendra migrated to Central Java and in power there. In this same century Langkasuka in the Malay peninsula became part of the kingdom. In the following Pan Pan and Trambralinga northward Langkasuka also under the influence of Srivijaya. In the 9th century Srivijaya empire covering the territory of Sri Lanka Malay Peninsula Sumatra West Java Kalimantan, Sulawesi, Maluku and the Philippines. With a mastery of the maritime kingdom of Srivijaya empire who became great until the 13th century. After Dharmasetu Samaratungga a royal successor. He came to power in the period 792 to 835. Unlike Dharmasetu Samaratungga expansionist who did not perform military expansion but lbh chooses to reinforce the mastery of Srivijaya in Java. During his leadership he built the temple of Borobudur in Central Java, who finished in the year 825. Sebagaipusat teaching of Vajrayana Buddhist Srivijaya attracted pilgrims and scholars from countries in Asia. Among others, the pastor of the Chinese I-Tsing, who visited Sumatra in the course of study at Nalanda University of India in 671 and 695 as well as in the 11th century Buddhist scholar Atisha a Bengali origin who was instrumental in developing the Tibetan Vajrayana Buddhism. I-Tsing reported that Srivijaya became home to thousands of Buddhist scholars to be the center of Buddhist learning. Visitors who come to the island states that gold coins have been used in the coastal empire. Buddhism Buddhism Hinayana and Mahayana Buddhism also developed in Sriwijaya. From the historical record archaeological danbukti stated that in the 9th century Srivijaya has done colonization in almost all the kingdoms of Southeast Asia including Sumatra, Java, Malay Peninsula Cambodia and South Vietnam. Dominance over the Straits of Malacca and Sunda Strait makes Srivijaya as controller of the spice trade routes and the local trade who charge for every ship passing. Sriwijaya accumulate wealth as a port and trading warehouses waiting China and India markets. During the Khmer awalKerajaan also became the colony of Sriwijaya. Many historians claim that Chaiya in Surat Thani province of southern Thailand as the last royal capital of the Srivijaya influence apparent in buildings-style pagoda Borom That reply Sriwijaya. After the fall of Srivijaya Chaiya is divided into three cities namely (Mueang) Chaiya Thatong (Kanchanadit) and Khirirat Nikhom. Srivijaya was also closely correlated with Pala kingdom in Bengal and an inscription dates to about 860 records that the king Balaputra a monastery dedicated to the University Nalada Pala. Relations with the Chola dynasty in southern India is quite good and then bad after Rajendra Coladewa throne and attacked in the 11th century. Minanga is the first power of Srivijaya who were the competitors who finish can be conquered in the 7th century. Malay kingdom has gold mining as a source of economic and Swarnnadwipa said (the island of gold) may refer to this. And then Kedah is also subject and subordinate to the area. In the first half of the 10th century between the fall of the Tang and Song dynasties rose with foreign trade is quite widespread, especially Fujian royal and the rich countries Guangdong Min Nan Han empire. Srivijaya undoubtedly benefited from this trade. In 903 Muslim writer Ibn Battuta was impressed with the prosperity of Srivijaya. Urban empire includes Palembang (specifically Mount Seguntang) Muara Jambi and Kedah. In the year 902 Srivijaya sent tribute to China. Two years later, the last king of the Tang Dynasty conferred the title of the messenger of Srivijaya. Of Chinese literature has the name of Arab envoys this provides information that in those days was associated with Srivijaya Arabian allow Sriwijaya has entered the influence of Islam in the kingdom. Coladewa Rajendra Chola king in the year 1025 from the Coromandel southern India conquered Kedah from Srivijaya and robbed. Then the kingdom of Chola pass attack and conquest of Srivijaya successfully for several decades following the whole empire of Srivijaya was under the influence Coladewa Rajendra. Nevertheless Rajendra Coladewa still provide opportunities to the kings who conquered to remain in power as long as remains subject to him. After the invasion was the end result in weakening the hegemony of Srivijaya and then some areas subordinate to form his own empire and later emerged as a new force Dharmasraya Empire and later annexed the region including the Malay Peninsula and the Sumatran Srivijaya itself. San-fo-term TSI especially in the year 1225 no longer synonymous with Srivijaya, but has been synonymous with Dharmasraya where the administrative center of San-fo-TSI has been moving so from a list of 15 countries subordinate San-fo-TSI is a list of the royal colony Dharmasraya reply before is a subordinate area of Sriwijaya and turned control of Srivijaya and its other colonies. Between the years 1079 - 1088 Chinese chronicles record still bahwaSan-fo-ts'i still sending envoys from Jambi and Palembang. In an article titled China's Sung Hui Yao stated that the kingdom of San-fo-TSI in 1082 sent a messenger which at that time China under the reign of Emperor Yuan Fong. The ambassador conveyed a letter from the king of Kien-pi subordinate San-fo-TSI who is a letter from the daughter of the king who entrusted the affairs of the state of San-fo-227 TSI and also submit tahil thatch jewelry and 13 pieces of clothing. And then proceed with the next messenger delivery in 1088. Based on Chinese sources in the book Chu-fan-chi written reply in the year 1178 Chou-Ju-Kua describe that in the islands of Southeast Asia there are two kingdoms very strong and rich that San-fo-ts'i and Cho-po (Java). In Java, he found that people embraced Buddhism and Hinduism, while the people of San-fo-ts'i Buddhist and has 15 regional subordinates who include; Pong-fong (Pahang) Tong-ya-nong (Terengganu) Ling-ya-si- kia (Langkasuka) Kilantan (Kelantan) Fo-lo-an (estuaries Dungun Terengganu area now) Ji-lo-t'ing (Cherating east coast of Peninsular Malaysia) Ts'ien-mai (Semawe east coast of Peninsular Malaysia) Pa-t 'a (Paka River east coast of Peninsular Malaysia) Tan-ma-ling (Tambralingga Ligor southern Thailand), Kia-lo-hi (Grahi Chaiya is now southern Thailand), Pa-lin-fong (Palembang) Kien-pi (Jambi) Sin-t 'o (Sunda) Lan-wu-li (Lamuri in Aceh) and Si-lan (Cambodia). 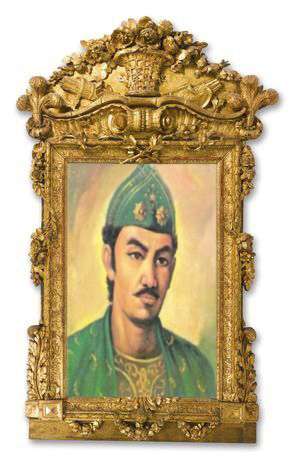 DalamKidung Pamacangah Babad Arya Tabanan and is also called 'Arya Damar' as a regent of Palembang deserving help Gajah Mada in conquered Bali in 1343 Prof. C.C. Berg considers synonymous with Adityawarman. And then in 1347 Adityawarman self-proclaimed king in accordance with the manuscript Malayapura who are on the back of the Arca Amoghapasa. Then from the Book of the Cape Land Law who was probably written before the year 1377 there are also words palimbang earth. In the year 1275 Singhasari successor kingdom of Kediri in Java do an expedition in Pararaton called a kind of expansion and conquest of Grounds Malays who are known by name of Expedition Pamalayu Kertanagara king who then presented the statue Amoghapasa Singhasari to Srimat Tribhuwanaraja Mauli Warmadewa Dharmasraya as king Malays who are in Padang Inscription Roco. And next in 1293 appeared as a substitute Singhasari Majapahit and after the Queen ascended the throne Tribhuwana Wijayatunggadewi responsibilities to Adityawarman a Peranakan Malay and Javanese to conquer Swarnnabhumi back in 1339. And in those early Srivijaya's name was called again but nothing has replaced it with the name of Palembang in accordance with Nagarakretagama who describes the Majapahit empire. In trading Sriwijaya became the controlling trade routes between India and China that is with control over the straits of Malacca and Sunda straits. Arabs noted that the Sriwijaya has a variety of commodities such as camphor wood aloes cloves cardamom nutmeg ivory gold and tin enacting as rich as the king of Srivijaya kings in India. This abundance of wealth who have allowed Sriwijaya buy loyalty of vassal-vassal throughout Southeast Asia. Sriwijaya kingdom's first Indian culture is much influenced by Hindu culture and then followed by Buddhism. Buddhism was introduced in Sriwijaya in the year 425 AD. Sriwijaya is the most important center of Mahayana Buddhism. Kings of Srivijaya controlled the archipelago through trade and conquest from the period of the 7th century until the 9th century. Thus directly contribute and develop the Malay language and culture in the Malay Archipelago. It is possible that the Srivijaya who renowned as a port trading center in Southeast Asia as well as a center of Buddhist learning is also visited by migrants from the Middle East and began to be influenced by Muslim traders and scholars. So some royal who was originally a part of the Srivijaya and then grow into the forerunner of Islamic kingdoms in Sumatra, one day while weakening the influence of Srivijaya. The influence of many Arab Muslims who visit the Srivijaya Srivijaya king named Sri Indrawarman who converted to Islam in 718. Thus it is very possible the social life of Srivijaya who adl social community within the community are Buddhists and Muslims alike. Srivijaya king was recorded several times corresponded to the Islamic caliphate in Syria. Even at one adl manuscript letter addressed to the caliph Umar ibn Abdul Aziz (717-720M) with a request that the caliph refused to send preachers to the palace of Sriwijaya. Based on the founder of the Malay Sultanate of Malacca Tale claimed as a prince of Palembang Palembang noble family of the Srivijaya dynasty. This shows that in the 15th century grandeur and prestige prestige Srivijaya still respected and used as a source of political legitimacy for the rulers in the region. Sriwijaya name has been used and perpetuated as the name of the street in various cities and this name has been attached with Sumatran city of Palembang and Sriwijaya Selatan.Universitas founded in 1960 in Kilkenny is named after the kedatuan Sriwijaya. Similarly pulaKodam Sriwijaya (military commando units) PT Sriwijaya Fertilizer (Fertilizer Company in South Sumatra) Sriwijaya Post (daily newspaper in Palembang) TV Sriwijaya Sriwijaya Air (airline) and Sriwijaya Sriwijaya Stadium Football Club (soccer club Palembang) all named Thus to respect the honor and celebrate the glory of Srivijaya empire. In addition to the Majapahit nationalists Indonesia Sriwijaya also glorified as a source of pride and proof of past glory Indonesia.Kegemilangan Sriwijaya has been a source of national pride and identity of specific areas for urban dwellers Palembang in South Sumatra province and the entire Malay race. For residents of Sriwijaya Palembang sublime has become the inspiration of art and culture such as traditional songs and dances Gending Sriwijaya. Same thing goes for the people of southern Thailand who recreate dances Sevichai (Sriwijaya) that based on the elegance of art and culture of Sriwijaya. Inscription Ligor A conquering Cambodia.